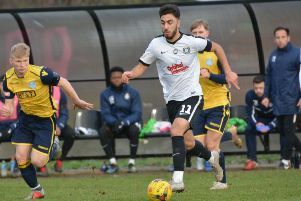 The home defeat leaves Berko three points adrift of Didcot in the fifth and final playoff spot in the Southern League Division One Central with four games to go. Christie opened the scoring in the seventh minute, when his shot went into the ground and bounced over keeper Xavi Comas-Leon. He got his second early in the second-half when converting a penalty. Berko got one back on the hour. A corner was not cleared and Ryan Kinnane’s effort was stopped, but Max Farrelly went into the six-yard box and bundled the loose ball home. This gave Berko heart and they played better when searching for an equaliser. Sub Ashley Morrissey cut inside from the left and crossed for Jonathan Lacey, who put the ball just wide and away keeper Dan Green pulled off a fabulous flying save to keep out Berko’s top scorer Matt Bateman. Lacey got underneath the ball when connecting with a cross to squander a chance. Overall the visitors deserved the win and might have added a third via Terry Griffiths but he blundered. Berko have two home cup semi-finals in a week. 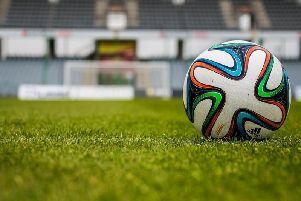 They were due to host Chipperfield Corinthians in the St Mary’s Cup last night (Tuesday) as the Gazette was going to press. The following Tuesday, April 16, they host Tring Athletic in the Herts Charity Shield. Sandwiched in between Berko visit eighth-placed Thame United on Saturday as the playoff fight continues. Thame are only behind Berko on goal difference.